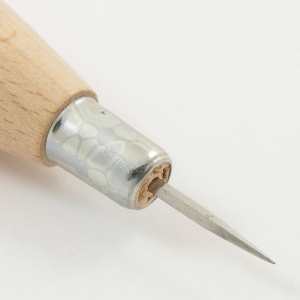 This leather stitching awl has a very sharp, diamond shaped blade, which cuts a neat hole in your leather - just what you need for sewing leather projects by hand. 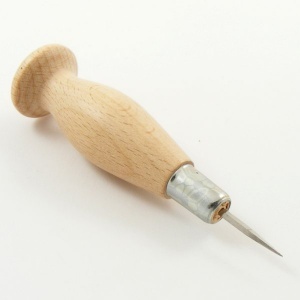 It has a smooth beechwood handle which fits comfortably in your hand, giving you all the control you need to make your holes safely and easily. 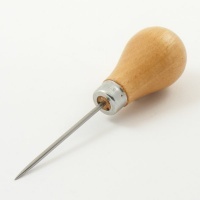 Saddlers often use the handle of their stitching awl to help push the needle through, when sewing thicker leathers. 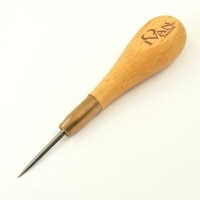 This listing is for a small sized sewing awl, which has a blade of approx 16-19mm long, and at it's base, about 2.5mm wide. 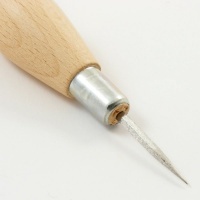 It's ideally suited to finer stitching projects such as purses or lightweight repairs.